So turns out that subjecting yourself to an intense regimen of chemotherapy and brain radiation for 37 days straight can kinda wear you down a bit. But hey, things are getting better. I’m not entirely sure why– the radiation is supposed to have cumulative effects, meaning the zombie sleepiness gets more intense the longer you do it. And that has been the case. It’s like having that “wow, what a long day, I’m ready for bed!” feeling pretty much constantly, even right after you wake up in the morning. Which isn’t technically an unpleasant feeling, it just gets a little old when you’d rather actually be HAVING a nice long day than feeling like you had one and need to pass out. Plus the chemo is still pulling its weird tricks. I guess, in the end, I’m just getting used to it. Getting used to feeling like evil zombie creature and not spending so much time focusing on the fact that I don’t feel 100% normal right now. Oh speaking of evil zombie creatures! 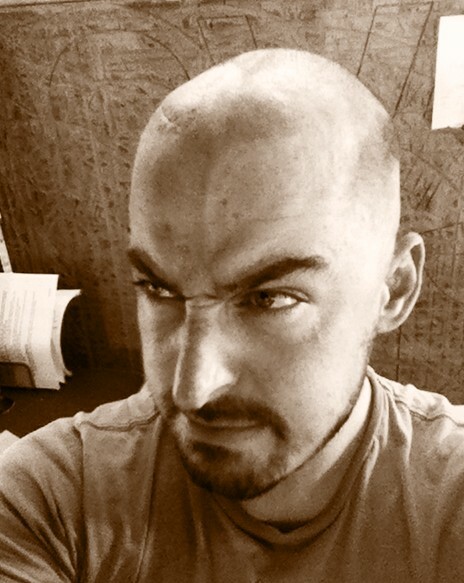 I shaved off my hair (it was falling out in a pretty patchily weird way, figured better just to skip Cancer Head and go straight to Regular Average Bald Guy) and I have discovered that I might have a career as some kind of creepy Evil Supervillain. So I’ve got that going for me! The scar really seals it, although you can’t see it in this pic. I’m trying to figure out how to get some green LEDs installed so I have this glowing steaming green crevice in my head like a baby dragon is about to hatch from my skull at any moment and start melting faces with its radioactive fire breath. That’ll really give those do-gooding superheros pause! But, as usual, I’ve gotten sidetracked. How’s the treatment going? Well it isn’t going any worse, and I think I’ve started to get used to it a bit, so it’s going better. Yeah. Better. That’s the ticket! And… (drum roll)… I only have five days to go! Crossing my fingers that they give out some kind of enormous gilded heavyweight boxing belt for completing this rigorous de-chancing course… and if they do that it matches the super villain outfit my mom is stitching up for me. You’re a warrior Chad. You’re having such an odd but very welcome influence on me right now. It’s amazing that through this you’ve found a way, intentionally or otherwise to give… I’m thankful for that Chad, truly and deeply thankful. Go Birds. I’m glad you’re finally able to really leverage the single eyebrow raise to nefarious effect. There’s a sweet, sweet Ming the Merciless quality to the bald Peacock. You look part Klingon in that photo! Thanks for sharing your experiences – it’s really inspirational, especially as I haven’t got to the surgery part of having a brain tumor yet.